The International Cartographic Association (ICA) Commission on Planetary Cartography was officially established on the basis of the ICA Planetary Cartography Working Group at the ICA Congress in Ottawa in August 1999. Its goal is to develop materials and information intended to aid in the global dissemination of planetary cartographic information. The overall theme of this effort is the harmonization of international planetary cartographic activities. The commission’s activities can help especially in those countries not actively involved in ongoing spacecraft missions, bringing together scientists from diverse backgrounds (planetary science, earth science, cartography) who have not interacted previously, along with map and atlas publishers. 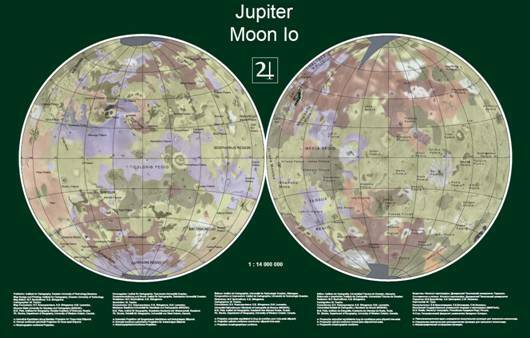 The Planetary Cartography Database, the Multilingual Planetary Maps, and the Multilingual Glossary can serve as a reliable resource for cartographers who wish to produce and study planetary maps. Further current activities focus on producing maps of Galilean Satellites. Commission activities are coordinated by Kira Shingareva (Russia). 2009: 24th ICC, Chile, Santiago, November 15-21. 2010: 5th International Workshop on Digital Approaches in Cartographic Heritage, Vienna, 2010. II. 22-24. 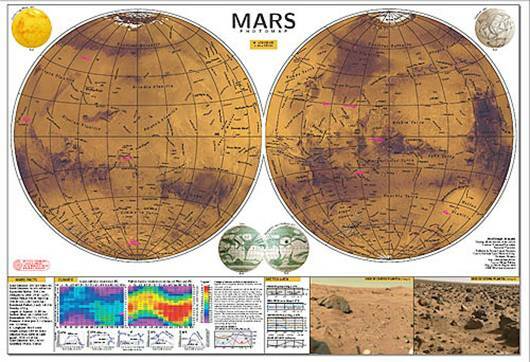 B2001 / D2002 Multilingual map of Mars. B2008 Topographic map of Mars, Lambert projection. Golodnikova I.: Cartographic support of a new landing site for “phobos-grunt” mission. 25th ICC, Paris, 3-8 July, 2011. Hargitai H.: Planetary nomenclature: a representation of human culture and alien landscapes. 25th ICC, Paris, 3-8 July, 2011. Golodnikova I.: Io map final version. 25th ICC, Paris, 3-8 July, 2011. Golodnikova, Irina: The Second Stage Of The Multilingual Map Project: Mapping Of Giant Planets Satellites. 24th ICC 2009, Chile, Santiago, November 15-21. 2009. 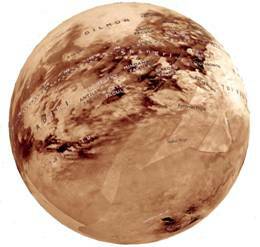 Hargitai H. and M Gede: Three virtual globes of Mars: topographic, albedo and a historic globe. EPSC2009-47. 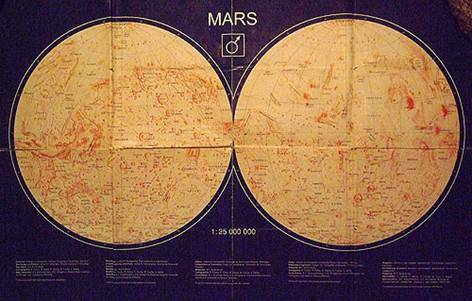 Hargitai H. I., Shingareva K. B. Golodnikova I. Y. Gede M. Historic Soviet Planetary Maps Online. 41st Lunar and Planetary Conference, Houston, USa, 1-5 March 2010. Hargitai, Henrik; Arnold Gucsik and Tasuku Okumura: The new bilingual photomap of Itokawa 3rd Planetology Seminar Budapest, 4-5 September 2008. Hargitai H., M. Gede: Multilingual Virtual Globes Of Venus And Mars. ICC 2009, Chile, Santiago, 2009. Hargitai H.: International Planetary Cartography Database . ICC 2009, Chile, Santiago, 2009. Hargitai, Henrik and Mátyás Gede: Historic Virtual Planetary Globes and Maps. 5th International Workshop on Digital Approaches in Cartographic Heritage, Vienna, 2010. II. 22-24. Hargitai, Henrik: International Planetary Cartography Database. 24th ICC 2009, Chile, Santiago, November 15-21. 2009. Lazarev E.: Venus mapping at small scale: source data processing and cartographic interpretation. 25th ICC, Paris, 3-8 July, 2011. Nass A.: Requirements for planetary symbology in geographic information systems. 25th ICC, Paris, 3-8 July, 2011. Nass, Andrea: Conception Of A Geo-database And An Application-oriented Query System For Geological Mapping Of Martian Surface. 24th ICC 2009, Chile, Santiago, November 15-21. 2009. Rozhnev I.: Development of the planetary cartography web-site with open source content management system. 25th ICC, Paris, 3-8 July, 2011. Rozhnev I.: Multilingual planetary cartography glossary. New version. 25th ICC, Paris, 3-8 July, 2011. Shingareva, Kira: Nomenclature Of Planetary Surface Details: Current State And Problems. 24th ICC 2009, Chile, Santiago, November 15-21. 2009. Shingareva, Kira; Ivan Rozhnev and Dmitri Zhukov: Creation of Electronic Version for “The Atlas of Terrestrial Group Planets and Their Moons” and its Updating Possibilities. 5th International Workshop on Digital Approaches in Cartographic Heritage, Vienna, 2010. II. 22-24.